Size: Flowering stems at the tips are 2 - 5 in. 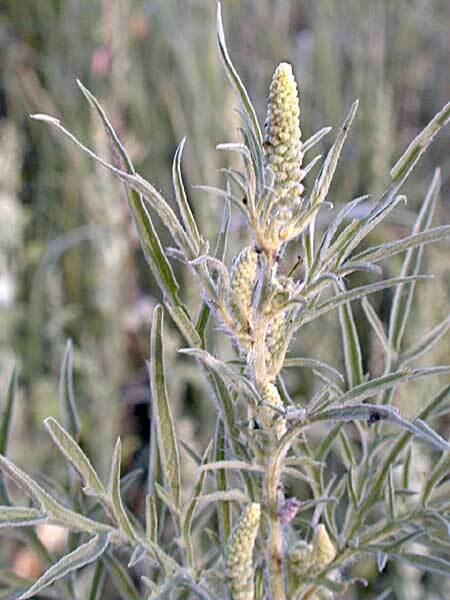 long, containing many heads of male flowers. Female flowers are tiny and hidden in the leaf axils. Notes: 12 species of Ambrosia in Arizona. Slimleaf Bursage entry in the online edition of An Illustrated Guide to Arizona Weeds , Kittie F. Parker, University of Arizona Press.